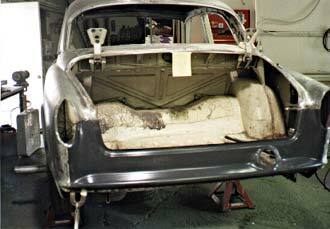 The biggest challenge in this restoration was to restore structural integrity to the unibody. 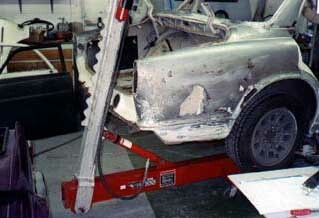 We'd uncover more problems as the project progressed, but the first order of business was to get the car straight and true. If that could not be done, we'd have to conclude that The Volvo was headed for the crusher. I wish I could have been there to see it happen, but Bob pulled that particular rabbit out of the hat. Quite a few hours of work with a frame stretcher later, what remained of the rear third of the car was back where it needed to be -- straight, even, level, and not causing deformation of the roof. 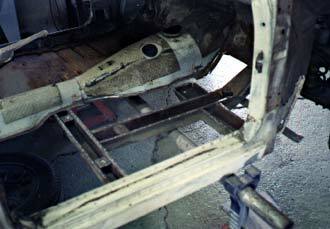 The floors under the rear seat and in the trunk were no longer kinked, and both rear door openings were once again the same length. ...followed by an entirely new rear panel we got from Tom Swartz. Bob was able to salvage and reuse the structure that goes behind the panel. Bob turned up a parts car that had many of the sections ours needed. 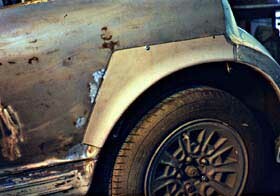 It gave up the outer skins of both C-pillars. 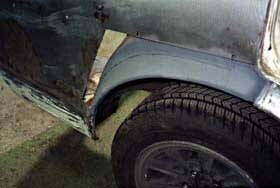 In this instance, the underlying structure on our car was still good. 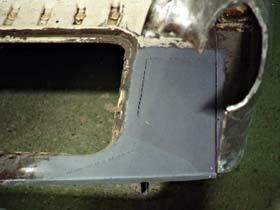 ...followed by the outer skin. Many parts of the body have two layers like this, and both must be sound to give the body its necessary strength and rigidity. Yet more problematic were the sections extending from the bottom of the A-pillars into the top of the firewall on both sides. Here we're looking at the right side -- the four bolt holes are where the upper door hinge attaches, if that helps orient you. Several pieces of metal join here, and all were rotten. I don't have a post-repair picture of this, but the parts car donated these sections as well. The new battery box, also from Tom Swartz, was stuck in temporarily for this photo. 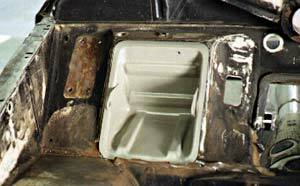 After a lot more picky underhood repair, it has now been welded into place permanently. We didn't quite know what to do with the floor on the right side, beyond removing it entirely (the other side was not exposed to leaking battery acid and is repairable). A new section was available, but was known not to have the depression for a rear passenger's feet, and we thought that necessary. Bob thought he might rework it to suit, but the whole section turned out to be so poorly made that we didn't want to use it at all. Bob will fabricate a floor from scratch. 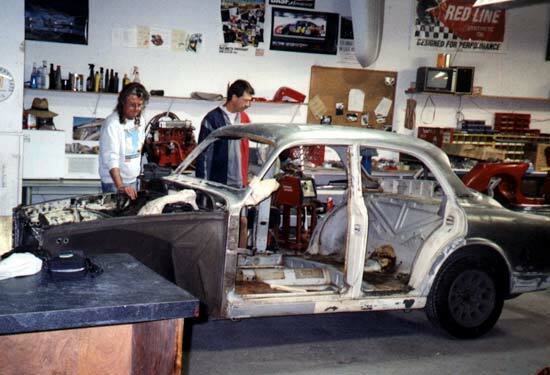 Every bit of paint was then stripped, the body was etched with a chemical preservative, and all the loose parts were sent out for sandblasting. 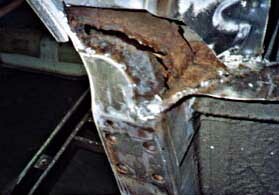 This exposed more problems, even in parts that didn't appear to have rust under the paint. 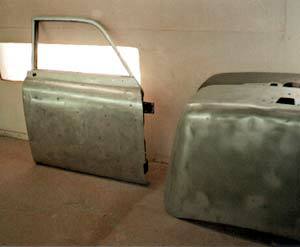 If you sandblast until there's no rust at all, sometimes that means no metal either. 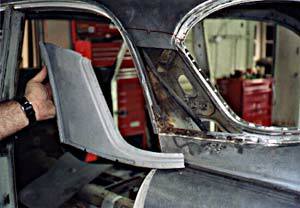 Bob had to weld in some more small sections in the bottoms of the front fenders and doors. A few weeks after these photos were taken, we paid another visit to The Works. The whole unibody has had several coats of primer and sanding done, and it's amazing. You absolutely cannot tell that there was ever anything wrong with it, except there's still no floor. The loose parts were in light primer to reveal any ripples or imperfections, which I expect Bob has now made perfect. We'll start next issue's coverage with pics of that stage. We've also decided on the paint color. We wanted something that would look as if it might be original from 50 feet away, but would be zoomier than that close up. Our choice was for Volvo #102, which is the metallic medium gray with blue-green overtones color found on '70 and '71 1800s, modified by mixing in 20% blue pearl. This should fit the character of the car while accentuating all those non-boxy curves. The interior will be done in a complementary shade of cloth upholstery, but we haven't worked out the details of that yet -- original seats or something newer? Stay tuned, and all will be revealed.